Watching the parade in the Pinault house—another fine tradition. Image: Sarah Pinault. I’m a big fan of Christmas music and my husband is a big fan of Thanksgiving. Over the years, this combined set of interests has led to an annual search for Thanksgiving music to play over dinner. We’ve come a long way since that first hobbled-together CD, which consisted mostly of “Alice’s Restaurant” and Adam Sandler. This year, we both agree, we have hit upon a playlist to be most thankful for. We have family favorites that have survived each year’s culling, we have old classics that were wrongly assigned to Christmas, and this year, we have discovered new-to-us gems. This list is too good not to share and there is still plenty of time for you to get your playlist in order, so here is the 2014 Pinault Thanksgiving playlist. “Thanksgiving Day” by Ray Davies. Traditionally the second track on our CD, Ray was promoted above Bing this year. This song has a great beat, great lyrics, and a great artist: Ray Davies, lead singer and songwriter for The Kinks. The linked video is from his performance on Conan back in 2005. “I’ve Got Plenty to be Thankful For” by Bing Crosby. Taken from the movie Holiday Inn, this is Bing holiday gold. 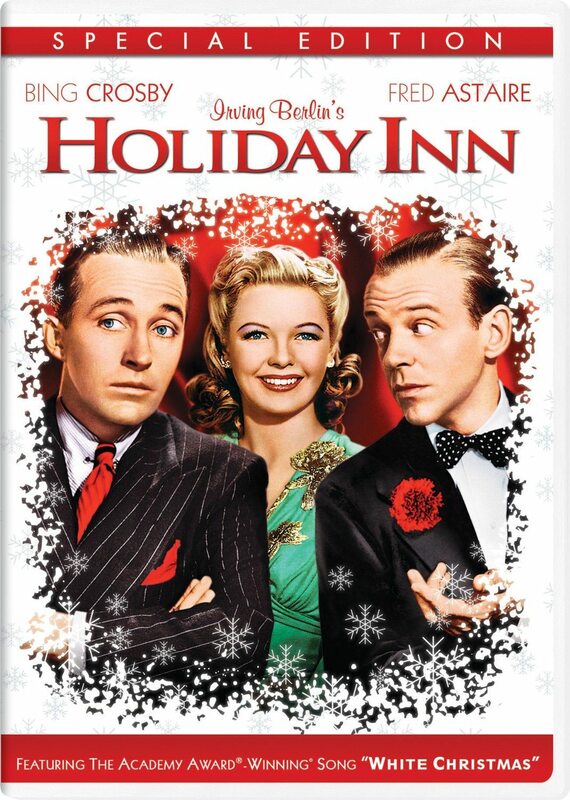 If you aren’t familiar with the movie, Bing plays a disillusioned performer who decides to open Holiday Inn, a quaint retreat in Connecticut that only opens on holidays. The movie is full of original songs for each holiday featured, and the Thanksgiving section is a family favorite. “Prayer of Thanksgiving” by Johnny Cash. Lifted straight from the classic television series, Dr. Quinn Medicine Woman, the man in black offers a poetic addition to our Thanksgiving playlist. It has taken years to find a decent recording of this, as most are from people who have filmed the episode running on their TV. “The Food on Our plates” by Ciara Thorton. This has a nice piano base and beautiful vocals. This song is new to us this year (thank you Spotify), but I have a feeling it will survive to next year’s CD. This is from a 2004 compilation album called Thanksgiving, but is the only one that made our cut. It can be obtained on Google Play. “T-day” by Jo D. Jonz. Get your turkey on big-band style. This song injects a little Frank Sinatra into the day. It’s pretty tongue-in-cheek and my five-year-old adores dancing away to this. “We’re Thankful” by Moose A. Moose. This is a song from in between shows on the Nick Jr. of years gone by. It’s also one of several kid-specific tracks on the disc. This one survives each year because it amuses me so, but it was on my husband’s cut list this year. It’s got more saccharine in it than the rest of our songs, and a whole lot of bounce. “The Turkey Song” by William P. Hitri. A Thanksgiving earworm if ever there was one. This is the perfect song to teach your kids to sing on the way to grandma’s house; the little voice rendition of the tongue-twisty chorus will bring a smile to anyone’s face. There are some great lyrics in here. “Roll, roll, roll to Plymouth Rock” and “The bird beast they call Turkey” are among my favorites. “Thanksgiving Day” by Marcella Detroit. Another new addition this year, thanks to a needle-in-a-haystack search on SoundCloud. The opening has a touch of Iz’s “Somewhere Over the Rainbow” to it. This was released last year, and we just found out that another version was released this year. Last year’s is much better; it has more bounce to it. “Thanksgiving Song” by David Campbell. This was one of the first Thanksgiving songs we found, and has a touch of Bing Crosby/David Bowie’s “Little Drummer Boy” about it. “Count Your Blessings” by Bing Crosby. This song is taken from the movie White Christmas, which was made to follow up on the success of the song “White Christmas” in Holiday Inn. It is traditionally used on Christmas albums, but really it’s a Thanksgiving song, so we stake our claim to it for our collection. “Thanksgiving Theme” by The Vince Guaraldi Trio. It’s the Great Pumpkin Charlie Brown and A Charlie Brown Christmas get all of the attention at this time of year, but A Charlie Brown Thanksgiving should not be overlooked. True, the movie is sub par, compared to the others. However, Vince Guaraldi still brings his A game and the “Thanksgiving Theme” is just as good as “Linus and Lucy,” just not as familiar. “Thanksgiving” by The Whale & the Warbler. It’s contagious; more and more people are getting on our Thanksgiving song bandwagon. Recorded in a NY church in early 2013 and released last fall as part of their Thanksgiving EP, you can download the whole album on their website and name your own price. “The Thanksgiving Song” by The Ridler Brothers. Another one to survive over the years, it has the feel of Robert Keen’s “Merry Christmas From the Family,” but with less redneck and a slower pace. It’s a really beautiful song. “Stuffy Turkey” by Thelonious Monk. Three original songs appeared on Monk’s sixth album, It’s Monk’s Time, and this is one of three original compositions on it. It has been around since 1964, but not being big jazz fans ourselves, we just discovered it this year. With the exception of “Thanksgiving Day” by Marcella Detroit, which she is giving away for free on SoundCloud, you can get all of these tracks on iTunes. I hope you have time to get this together for your listening pleasure; it really is a delightful addition to the day. If you have any songs that you listen to on T-day, please do send them my way. ← GeekMom’s 2014 Gift Guide of STEM Toys and More!